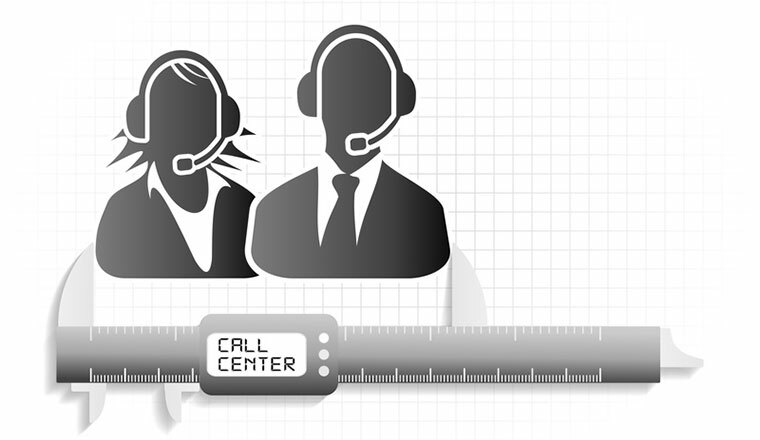 What is the best metric for your contact centre? We gathered opinions from across the industry to try and determine what the best metric for the contact centre really is. What metrics are the most popular? While there is no “one size fits all” solution to choosing metrics, I do believe that any metrics are better than no metrics. When deciding on which metrics to use, you should base your decisions on the wider goals of your organisation, and make a conscious effort to blend process and outcome metrics for a more balanced perspective. Most importantly of all, make sure you do something with the data that you extract from using your metrics. Don’t just write up reports! Derive actions for improvements and use this information to improve your customer and agent experience. With thanks to Carolyn Blunt, Managing Director at Real Results Training Ltd. While an individual metric does have a value, it is best not to focus on one. Instead, you should select a combination of task-related (e.g. AHT and Sales Volume) and performance-related metrics (e.g. NPS and Customer Effort) that support your overall business objectives. Before deciding on which metrics to use, you should also consider how your departments are interlinked. This is because metrics in one department can be to the detriment of the end-to-end process. For example, an agent focusing too much on AHT may choose to pass a simple problem on to another department rather than spend time resolving the issue over the phone. Decisions such as these could be leading to extreme elevations in cost such as sending an engineer out to fix a simple problem. 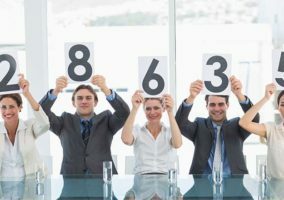 Rather than picking just one metric, you could try pooling all of your key metrics together into a single overall score that you can track. 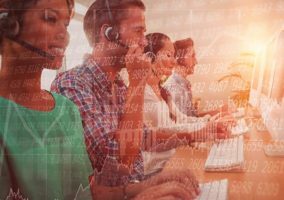 Alex Loach wrote a good article on this – Designing a single contact centre metric to improve performance – and called it the Authentic Core Linkage (ACL) score. The idea is to look at every contact centre metric that you have at your disposal, and weight them based on importance to give you an overall weighted score/percentage. This approach will give you a truly personalised measure of your contact centre’s performance. When selecting the metrics to include in your combined metric, I believe it is important to include both an agent and a customer-focused metric in the mix. I would also prioritise First Contact Resolution and the Customer Effort score in my selection. 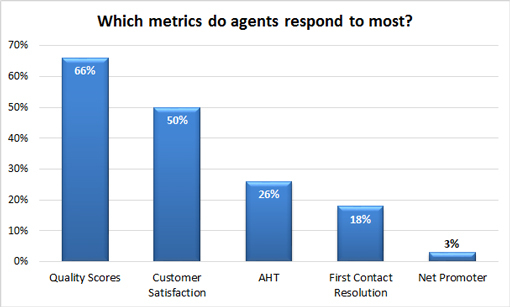 Which metrics do agents respond to most? 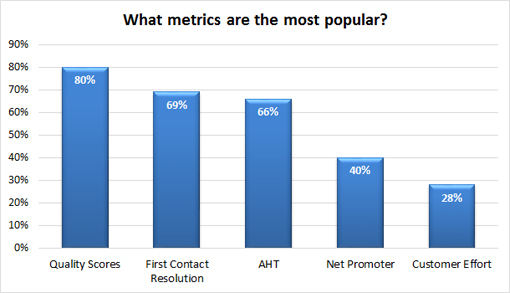 It is interesting to note (when comparing the two graphs) that there is a clear disconnect between the metrics which are most popular and those which drive agent behaviour, especially on First Contact Resolution and NetPromoter. Which metrics have worked best for our readers? Calls per hour has worked surprisingly well and agents have said they like this! We measure agent “available” time vs “not ready” time and that has worked well. Removing AHT as a metric really worked for us. I have had success with focusing on performance metrics that agents have complete control of. For example, their phone monitor scores. We measure Effort because the scores and feedback gives us something we can actually act upon to improve service. I have found that almost all the metrics work quite well. But only if you explain the formula, drivers and results to the agents. Quality scores have really worked, using a range of scenarios which agents are marked against. Calls per hour and agent productivity are both working well for us right now. The one that gained the best customer and agent reaction was simply asking the customer how friendly the advisor was – this was important for our values. Measuring “After Call” time has worked well. Quality is one of our most focused on metrics in the centre. By focusing on the back end of the AHT (work time) and taking the pressure off of the agents to rush off the phone, we found the agents were less stressed and the quality of the call remained high or improved. We also split AHT to say 80% talk time and 20% wrap-up, and measured the 20% which is in the advisors’ control. We have found success with monitoring quality alongside AHT and individual productivity (number of calls handled). The focus on this has naturally reduced our Average Handle Time without impacting our talk time/FCR. Which metrics have not worked? Assessing quality has worked, while AHT and Schedule Adherence has not. I have found that things that have worked are Quality Control and Talk Time, as they are personal, whereas abandon rate and call answer time in seconds don’t work, as these are not personal. Revenue per call has worked for us better than AOV (Average Order Value) or Total Sales. Measuring “wrap time” didn’t work. I have found that using Average Handling Time as a metric puts too much stress on the agents. What do you think is the best metric for the contact centre? Is Customer Effort the Best Metric? Quality scores are always number 1 for us, a reflection on the results of both surveys carried out. It has the greatest potential to improve agent behaviour. Remove AHT and only focus on quality as a metric. Agent engagement is no.1 for excellent customer service.